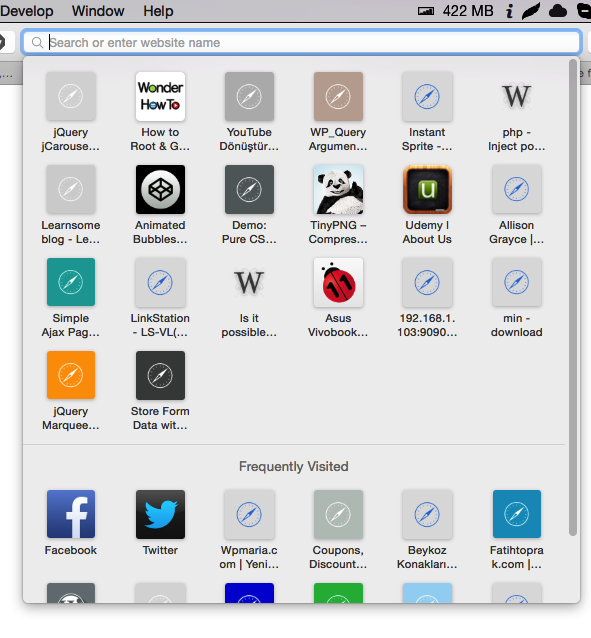 How to disable frequently visited items and favorites under the address bar in Safari 8? I want to remove the following frequently visited items and favorites under the address bar in Safari 8. How can I do this? Go to Safari Preferences → Search and disable Show Favourites. You can actually remove "Frequently Visited" without disabling "Favorites" now by right clicking the background of the "New Tab" page. I did this in Safari 10, not sure if this works in Safari 9. Uncheck "Show Frequently Visited Sites"
This setting in the "new tab" page is now also reflected in the URL bar. To remove Frequently Visited items, just simply click on the icon, hold and drag it out of the Window. Do this for each item you wish to dismiss. You cannot disable the frequently visited annoyance. Yes, you can manually remove sites from it, but the annoyance is turned on by default and cannot be turned off, so sites will always continue to appear there. Not the answer you're looking for? Browse other questions tagged macos safari yosemite preferences . Can I combine the address bar and the Google search bar in Safari? Address bar in Safari gone! Is there a way to disable “Top Hits” in the Safari 6 address bar? How to disable Safari Frequently Visited?